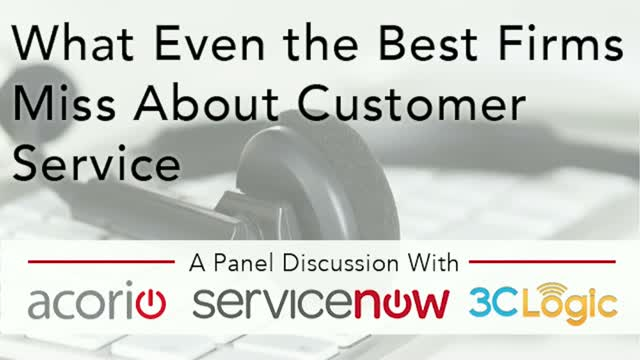 Join Acorio CEO, Ellen Daley, 3CLogic's CTO, Vikas Nehru, and ServiceNow's Senior Director of Business Strategy, Nitin Badjatia, for this panel discussion about Customer Service in the real world & what most companies are getting wrong. While we know that customer service is a critical defining characteristic, executing effective Customer Service somehow falls flat in the real world. The challenge is that delighting customers means more than just responding quickly to requests and issues from them – it means ensuring the all functions are involved and present in helping customers. This is a paradigm shift of the last 2 decades of Customer Service which set to prioritize response over resolution.